I stomped the landing, the slope popped, and I investigated. 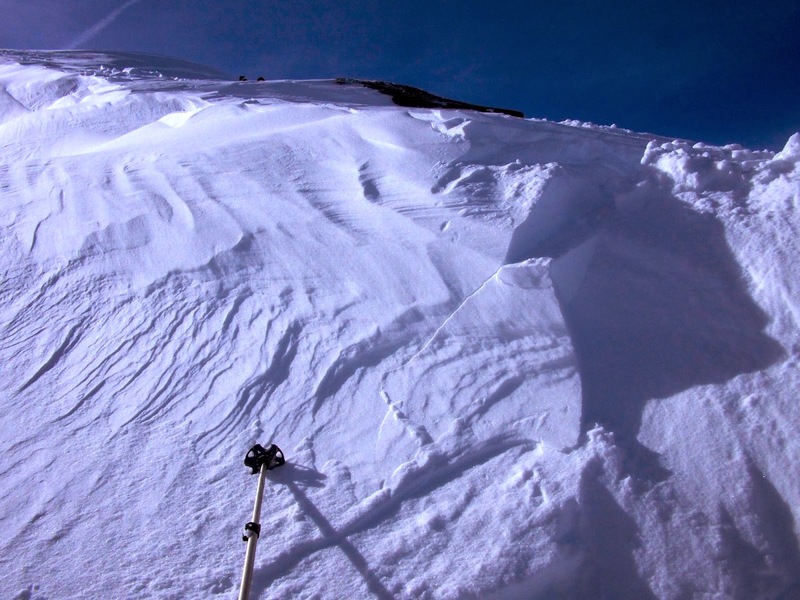 Below is the image showing the take off from where I landed, about head high, a good 5+ feet of air to stick. Classic slump failure, if the lower slope was convex rather than concave, a much larger slide may have resulted. What the photos don't show is the rocky surface that I landed next to. This, of course, was purposeful. If you want to test stability you do so in a maximally controlled environment. With the far majority of the hazard below and to the side of you, test results can be achieved with maximum safety. Of course, there is always the slight chance you are wrong and everything fails and that's part of the game. Participate or spectate. This was a good indicator of the highly varying degrees of stability. Low angle slopes, bomber. Steeper slopes in the trees, pretty bomber. Wind rolls, not so much! The facets still exist up here and now have 2-4 feet of snow on top of them. I didn't have my saw so no numerical test results to share. 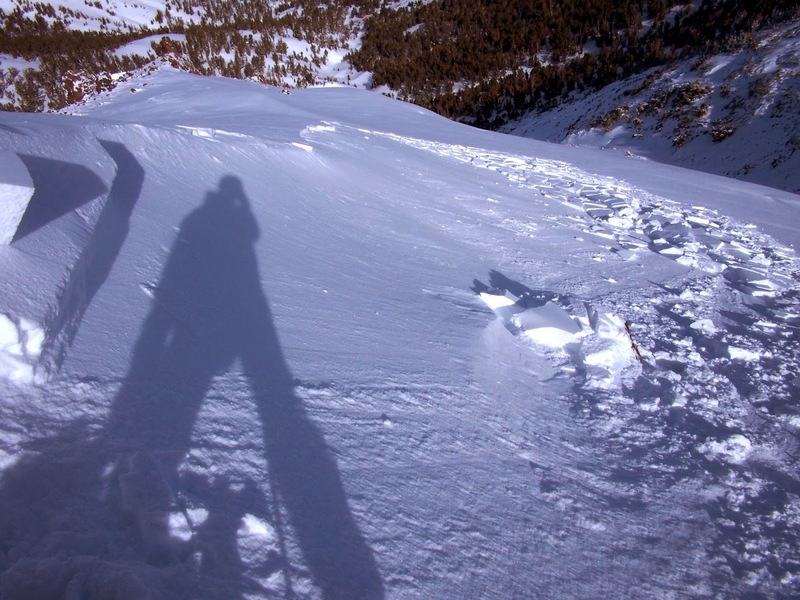 Qualitatively the results indicate a moderate avalanche hazard. 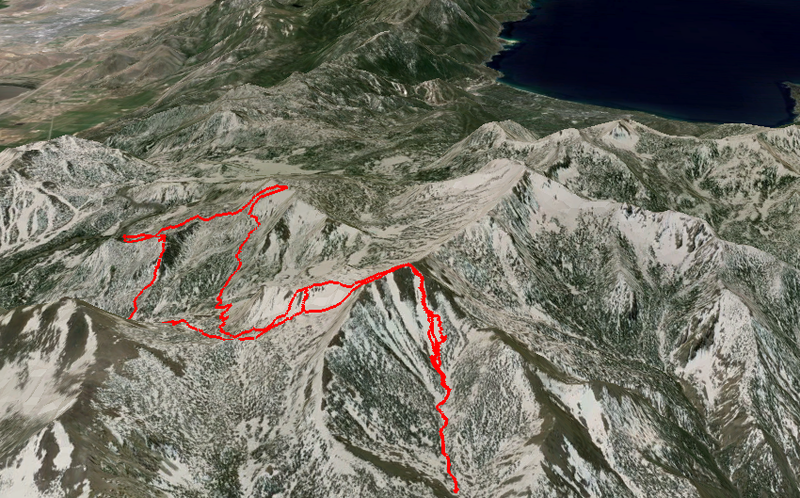 This was derived independent of the Sierra Avalanche Center, jfr (just for reference). The new load is generally stable (some density gradients but strength is high and right side up throughout the upper snowpack), but if things went, the results would be catastrophic. Enough speculative hyperbole, the skiing was mad fantastic! 5 stars. 7100 vertical feet of pow under azure skies is a great way to spend a Tuesday!